Do you wish you could invest like the late great Sir John Templeton (1912-2008)? If so, “The Templeton Touch” (by William Proctor with a Special Section by Scott Phillips, Templeton Press, 2012) is essential reading for understanding his successful strategies. It’s also the best publication I’ve read for comprehending John Templeton’s life and legacy as an investor in the field of ideas as well as the human condition. Speaking about Templeton’s legacy, John Schott is quoted as saying “Well, as a human being, I am sure that his legacy will be his foundation and what they will achieve in time.” I am one of those lucky people who were able to spend time with Sir John, learn about his life and benefit from his generosity. I once asked him what gave him most joy in life. Very quickly and candidly he answered that his biggest source of joy was his philanthropic work. When I asked him to be more specific, he gave the example of his support to increase awareness about how prayer and spiritual life can affect healing and health. Prior to this philanthropic enterprise there was almost no one teaching this topic. Now, such courses are offered in a majority of medical schools throughout the country. His success in this area led him to seek similar outcomes in promoting free enterprise and the principles of the free society. His performance in business made him the leading entrepreneur in mutual fund global investments during the 20th century and his insights and legacy carried on by theJohn Templeton Foundation are having a major impact in promoting intellectual entrepreneurship in the 21st century. From his basic outlook about economics and politics it’s easy to see that Sir John was a “Classical Liberal” not a Libertarian Anarchist. He stated that “you do have to have some minimum kind of government. But to the extent possible, governments should try to stop interfering with what people want to do.” He also avoided investments in products that created harm. He had a clear idea of what was conducive to human flourishing and what conspired against it. He argued that the “search for investment bargains involves looking for political and social contexts where free enterprise is thriving.” He sought investments in companies where the conditions and trends were favorable to the entrepreneurial spirit. Promoting entrepreneurship was one of his passions. Importantly, he saw that “the problem that socialism poses for the investor can ‘hardly be overemphasized,’” and he avoided investing in companies that were largely owned or controlled by governments. He also saw the danger that socialism poses for the human spirit. · Looking for opportunities all over the world: “The global aspect is the greatest legacy” argues Paul Matthews in one of the chapters. · Do not invest in areas with lack of transparency. Sir John avoided IPOs as the sector was not as transparent as that of publicly traded corporations. · There is always need for more research and more learning. A favorite maxim of Sir John was that “success is a process of continually seeking answers to new questions.” He applied this not only to investments but also to his entire philanthropic outlook. Even the Bible and other sacred books need to be complemented by free and open research seeking to discover new spiritual truths. 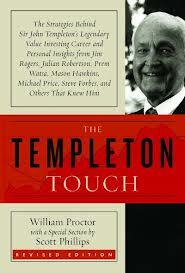 The “Templeton Touch” is more about discipline, research and character building than about any magical “touch.” The lessons in this book can improve your investments and your knowledge about the best aspects of the free enterprise system. But when readers finish these 400 pages they are also left with inspiring principles for a better life. Templeton encouraged those around him to think positively; to be thrifty, especially with the use of time, not letting wasteful thoughts occupy your mind; and to be grateful and generous. Guy Spier sums up what he got from Templeton: “The key, I believe, is to know yourself, and know who you are, and not force yourself into pockets where you cannot fit.” Good message for our businesses and for our lives.